RIOC provided their biographies below. Ms. Quinones is a Public Finance banker with over thirty years of experience meeting the infrastructure and general fund financing needs of state and local governments. Her expertise includes the general fund, infrastructure and transportation sectors, serving as the lead banker for some of the largest states and cities nationwide. Most recently, she managed the Western Region banking effort for Ramirez & Co., Inc., a privately-held securities firm based in New York. Prior to 2002, Ms. Quinones was with Citigroup, Raymond James Financial and Prudential-Bache Capital Funding in New York, working with the City of New York, and state agencies in the tri-state area and Puerto Rico. Ms. Quinones also served in the public sector, working with the New York City Deputy Mayor for Economic Development and Planning in 1996-1997. She represented the Mayor’s office on the boards of the New York City Economic Development Corporation and the New York City Industrial Development Authority. Ms. Quinones holds a BA in Economics from Princeton University. She was the 2000-2001 President of the Financial Women’s Association of New York and served on the Boards of Governors of the Municipal Forum and the Vanderbilt YMCA. Governor Mario Cuomo appointed Ms. Quinones to the Committee on Fiscal and Economic Priorities in 1994. Shelton J. Haynes is the Vice President of Operations of the Roosevelt Island Operating Corporation (RIOC). He is responsible for the oversight of the Island's day-to-day functions as well as management of the Corporation's various administrative and operational departments. 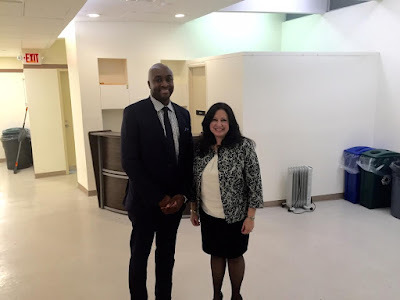 In addition, his role is to ensure that the corporation's operations and core functions effectively serve the needs of Roosevelt Island residents and other stakeholders, while complying with applicable laws and regulations. Mr. Haynes previously served as Chief Operating Officer at the Housing Authority of DeKalb County in Georgia, where he oversaw all agency operations, strategic and operational initiatives as well as the executive management team. Under his leadership he was able to transform under performing departments into high performing based on measurable key performance indicators and compliance audits. But the approval was not unanimous. During the March 10 RIOC Board meeting, Directors Margie Smith, Michael Shinozaki and Kathy Grimm objected to the process by which the new RIOC CFO and VP of Operations were selected, not the qualifications of the individual candidates themselves. Ms. Smith voted not to approve the candidates. Mr. Shinozaki and Ms. Grimm voted to abstain. Ms Smith noted that although multiple candidates were interviewed for each position by "various people", including RIOC staff, only Ms Quinones and Mr. Shelton were presented to be interviewed by the RIOC Board Directors. According to Ms. Smith, this same hiring process of excluding the RIOC Board Directors from the interview process has happened before in the selection of candidates for RIOC President, Chief Financial Officer and General Counsel. RIOC Director Fay Christian agreed with the comments of Ms. Smith but voted to approve because in her view it is necessary to fill these vacant positions immediately. Here's an excerpt of the March 10 RIOC Board discussion on hiring of new CFO. The RIOC Board approved hiring of the new CFO and Vice President Of Operations with a vote of 5 approving, 2 abstentions and 1 no. Roosevelt Island resident Board Directors Howard Polivy and David Kraut joined Ms Christian in voting to approve the hiring of the new CFO and VP Of Operations as did RIOC Chair Jamie Rubin and the NY State Budget Office representative. Here's the full March 10 RIOC Board discussion regarding hiring the new CFO, VP Of Operations and current General Counsel Susan Rosenthal to be Acting RIOC President. Roosevelt Island Residents Association (RIRA) Vice President Sherie Helstien said it was "cowardly" not to allow the RIOC Board to do its job by interviewing candidates for the CFO and VP Operations positions (at the 9 minute mark of video). The State of NY routinely disregards their own laws and the US Constitution by how it runs the Island. It is required to submit at least 3 choices to the RIOC Board. It did not. And what's more, the board itself is not consistent with the structure of government provided for by the US Constitution. Government is supposed to serve the people, and government bodies, including RIOC, are supposed to be comprised of elected members, not political appointments, and not even when they are our neighbors. If they actually had to stand for election, RIOC board members would never allow themselves to be bulldozed this way. It's unfortunate that NY State's way of doing business detracts from the appointment of people who could otherwise be viewed as highly competent to handle the job. While we wish our new RIOC staffers well, we also wish that Roosevelt Island enjoyed the same right to representative government that the rest of the country enjoys. Welcome to Roosevelt Island Ms Quinones and Mr. Haynes.